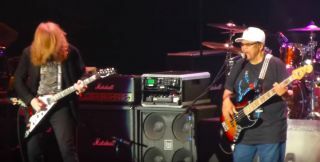 The Megadeth frontman jammed with Jonny Lang, Band of Gypsys’ Billy Cox and others. Hear Jimi Hendrix's Previously Unreleased Recording of "Lover Man"
Billy Cox, the bassist who worked with Jimi Hendrix as part of the Band of Gypsys and the Jimi Hendrix Experience, will hit the road with his own band on a multi-city tour. For the first time ever, Jimi Hendrix's rhythm section - drummer Mitch Mitchell and bassist Billy Cox - get together to discuss Jimi's legendary Woodstock performance.